There are two kinds of hard drive errors. A logical error is one in which data is written incorrectly on the hard drive. The Master File Table keeps track of where files physically reside on a hard drive, the filename, and the size of the file. In some cases, files are stored in chunks that may be scattered over the surface of the drive. The Master File Table keeps track of all those chunks as well. So what can go wrong? A virus, power glitch or faulty software can trample on the Master File Table, making it think that part of your photo, document or music file is "over here" when in fact it is "over there." This can result in programs saying that a file is corrupted when you try to open it. An error in the Master File Table can also make it appear that a file is gone, when in fact it's just orphaned on the disk. A physical error is actual damage to a sector of the hard drive's magnetic media; data written to a physically damaged sector cannot be read reliably, if at all. 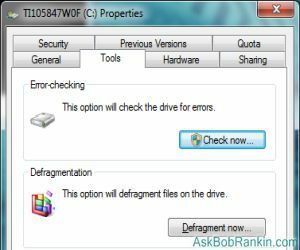 Windows 7 has ways of detecting and dealing with both kinds of hard drive errors. To check a hard drive for errors on Windows 7, click Start and open Computer. Right-click the drive you want to check and click Properties on the context menu. On the General tab, make note of the type of file system you have. It should say FAT32 or NTFS. Click the Tools tab. Under "Error-checking" click "Check Now." There are two options you can check or uncheck to modify how the error-checking process goes. Each involves a trade-off of time for thoroughness. When "Automatically fix file system errors" is checked, Windows 7 will attempt to correct any logical errors that it finds. Unchecking this box means Windows will simply report any errors it finds. It's best to leave this option checked, as it adds only a little time to the error-checking process and actually fixes things! When "Scan for and attempt recovery of bad sectors" is checked, error-checking can take a lot longer. Several hours may be required to thoroughly test every sector of a large hard drive. Windows does not actually "recover" bad sectors; it marks them as "unusable" so that no data will be written to them. Unusable sectors are typically a negligible fraction of a hard drive's total capacity. Click "Start" in the error-checking dialogue box to begin the scan you've specified. You will have to restart your computer before the scan will run. The scan actually takes place before Windows loads during startup. A utility called CHKDSK.EXE does the error-checking work. /V On FAT32: Displays the full path and name of every file on the disk. On NTFS: Displays cleanup messages if any. /R Locates bad sectors and recovers readable information (implies /F). So for example, CHKDSK C: /F /R would perform a full scan on drive C: (including bad sectors) and attempt to fix them. SpinRite 6 is one option, but it was last updated in 2004 to work with Windows XP and the NTFS file system. Many people swear by the benefits of SpinRite, but there are two potential downsides. The SpinRite website has a statement that the software may not work as well with modern SATA drives, and it costs US$89. TESTDISK is a free program that can help recover lost partitions, restore access to files, and repair boot records on disk that have become non-bootable. I have found TESTDISK to be a life saver on several occasions when I thought a hard drive was completely lost, and other recovery tools were unable to fix the problem. Most recent comments on "Windows 7 Hard Drive Errors"
Great article, Bob. Very thorough, and you take us through all the steps. Thanks for this follow-up "healthy hard drive" article. Do you have a view on how often the thorough scan ('scan for and attempt recovery of bad sectors') should be run? I try to run the 'automatically fix file system errors' scan every 1 - 3 months, but never run the thorough scan (unless I have errors that might be hard drive related). I keep hearing mixed things about Spinrite. It could be very useful but I'm not sure I feel I can trust software to work on my hardware when that software hasn't been updated since 2004. I am using Spinrite and love it, of course that I take backup of everything, but I recover damaged HD from friends that did not make a safety copy and until today Spinrite is working flawless for me. But I wish that a new release should be out, well 6 years on the market without an upgrade is a lot of time for a application. We see these programs are for Windows7 which is no longer supported by MSFT. Win10 has been around for several years and it has tools that will check and fix HD Errors and fix corrupted files with new ones. Win7 was a gtea OS but so was WinME, but time moves on, Just my opinion.